There are some things in life you just HAVE to do. If you find a dress at Anthropologie worth loving, and it’s on sale for $30 plus it fits you perfectly, you have to buy it. If you’re feeling down in the dumps, and you’re wearing sunglasses instead of make-up then you should get pizza and breadsticks for lunch. You should eat it with your BFF who won’t judge your lack of mascara. If your sister is in town, and you just bought strawberries at the farmer’s market, then you have to make her waffles with berries and whipped cream. Let’s drink coffee too. 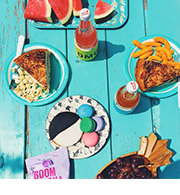 We’ll pretend it’s warmth is tricking our bodies into thinking it’s not 90 out. These waffles are frat boys. They are beer for breakfast. But mostly, the beer has a way of making these so light! The bubbles get all up in the batter making these similar to these yeast waffles, but without the wait. Mix it up, get waffle-y, no big deal. Whisk together the dry ingredients: flour, salt, baking powder, baking soda, and sugar. Melt butter in a medium saucepan. Add milk and beer and heat until mixture is warm. Whisk vanilla and eggs into the warm beer mixture. Make a well in the dry ingredients. Slowly pour wet ingredients into the well, whisking until smooth and barely any lumps remain. Pour into a pre-heated, lightly greased Belgian waffle maker (a regular waffle iron will work fine as well). Cook until it’s done to your liking. 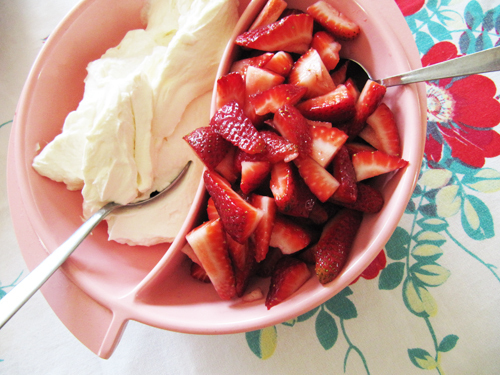 Serve immediately with sugary strawberries and whipped cream. Which is very similar to his “I want a blueberry,” face. those waffles are the only frat boys I would get with, ha! sometimes, you just have to. You just totally have to! Truer words were never spoken. 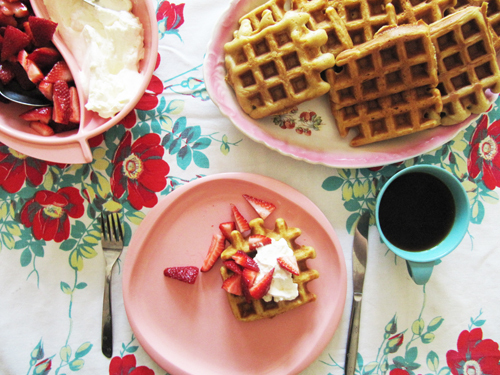 Finding a $30 dress at Anthro is definitely worthy of a big, waffle-y celebration. These look great, as Elliot I’m sure can attest to – you had to give him a little nibble, right? 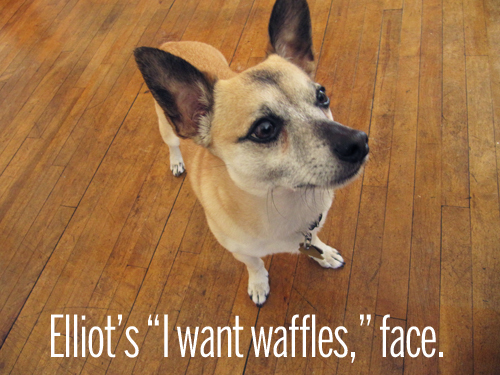 AND I totally let Elliot try the waffles. He was giving me the waffle-stare. I had to! Seriously the most amazing waffles ever. Plus- who needs mascara? Sunglasses are plenty. 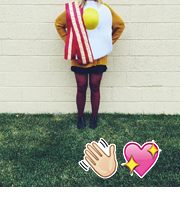 I love every bit of this blog post, and these waffles are happening on Saturday, yes ma’am. Thanks, guuuuuuuurl. And yay! Let me know what you think! Yeah man, waffle makers are just the most thoughtful on a weekend morning. If we were neighbors, I’d totally share mine! Right? It was a dreamy dress miracle! The dress I found is a grass green drop-waist mini dress. OMG. I hope you find a super-awesome one for a nickel soon! can i ask what kind of beer you used? i’ve made beer bread and i get totally different flavors depending on the beer i use and i’m sure the same applies to these. Thanks, Ashlie! Sounds like we have a lot in common! I used Dunkelweizen from Trader Joe’s in these. They don’t taste very beer-y, but I bet any wheat beer or maybe a lighter beer would work fabulously! Belgium nods and aproves… Well done, pretty! 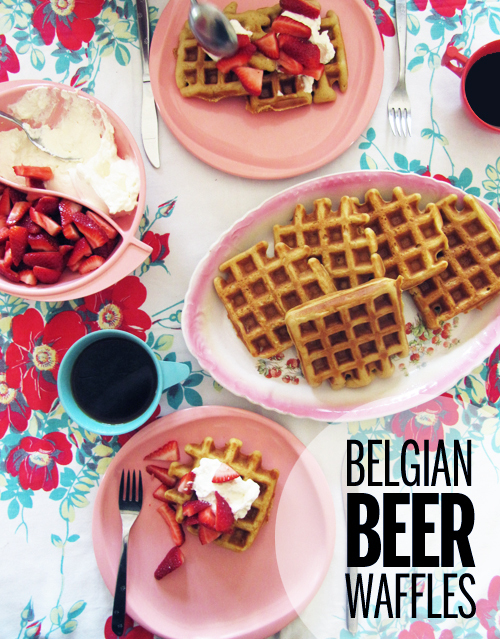 I’ll make these for mr. boyfriend’s birthday, can’t go wrong with waffles and beer. Is there any chance of seeing that gorgeous dress on you? From now on, I’m stalking the anthropology-site. Yeah man! I bet he’d love these. And I’m going to totally get a picture of this dress for you. It’s a good one! I made these for brunch an served em with fresh fruit, Nutella and whipped cream. They were awesome! Thanks for the solid recipe!